GeoCloud Nodes obtain readings from analog sensors, digitize them, and then transmit them via a cellular gateway to GeoCloud servers for processing and presentation. The use of nodes allows collection of measurements from a wide area and eliminates the expense and difficulty of installing and maintaining long runs of cable to centrally located data loggers. 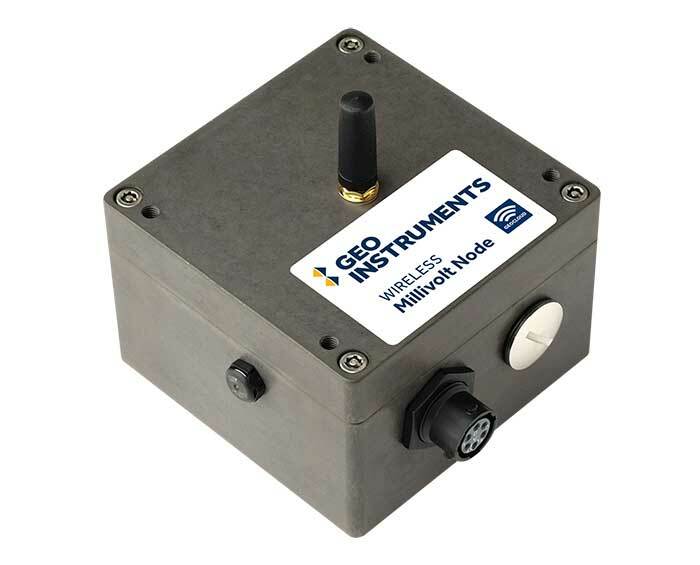 The GeoCloud Millivolt Node offers compatiblity with a wide variety of resistive bridge sensors including pressure sensors, foil strain gauges, torque sensors, load cells, load pins, moisture sensing, and conductivity sensors. Capacity: 1 mV sensor with thermistor. Excitation: 5.0V ± 0.1V, 150mA max. The GeoCloud RTD Node offers precision temperature monitoring using a variety of RTD temperature sensors. Capacity: 1 RTD / PT100 sensor. Range: -40 to +185°F (-40 to + 85°C). Resolution: < 0.01°C. Accuracy: < 0.1°C. Battery Life: 12 to 15 years with 20 to 30 minute reporting intervals. Operation Temperature: -40 to +185°F. Weatherproofing: IP68 at 1m for 24 hours. Required Connector: M12 female screw-in connector on sensor cable. Dimensions: 3.5 x 3.8 x 2.4 inches. Frequency: 2400-2485 MHz ISM Band. Range: 980 feet (300m) point to point. Can be extended when nodes act as repeaters.